Owls Well as a Volunteer Delivery Service! This week, as part of our daily Christmas advent activities, the kids and I volunteered to deliver food hampers with The Boys’ Brigade Share-A-Gift Project. This is the 2nd year that we have participated in the Share-a-Gift Project and I find that it is a really great way to introduce the concept of social responsibility to preschoolers. Volunteering with the Share-A-Gift project is relatively straightforward. There are two time slots available each day at 9:30am and 1:00pm from now until the 28th December 2013 and it is best to register your interest in advance at the BB share-a-gift website. You will receive a confirmation email as well as a reminder SMS on your phone! Then you’re all set to help deliver hampers with the Boys’ Brigade! Generous donations from the public! 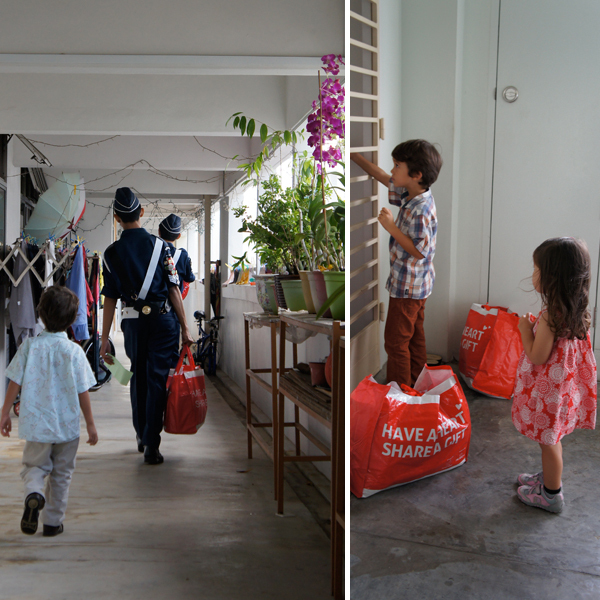 The kids and I reported for duty at the Boys’ Brigade HQ at 105 Ganges Avenue. There was a huge tent set up at the back of the office block, which was bustling with activity and both J and Little E went in to explore the area. On one side, boys from different companies all over Singapore were busily unpacking crates of donations from the public and sorting them neatly into stacks. On the other side, bright red bags were being filled with bags of rice and noodles, packets of 3-in-1 milo, instant tea and coffee, tins of biscuits, condiments and bottles of cooking oil, an assortment of canned food and some basic toiletries. This project reaches out to 7744 households, all of whom are currently receiving some form of assistance from government-funded community care programmes, as well as 24,812 households who are registered with various voluntary welfare organisations – so that makes for a ton of bright red bags! Most of the goods come directly from the generous hands of the public from collection centres outside NTUC Fairprice Outlets around Singapore. For people who are not able to get to the collection centres (or who wish to donate in bulk amounts), it is also possible to sponsor hampers via FairPrice Online. 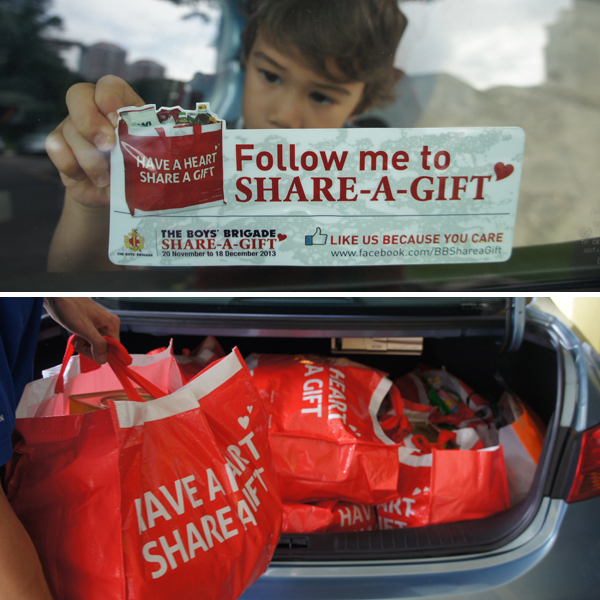 At the moment, BB share-a-gift has not yet met all their donation targets so if you do get a chance, just drop a can or two off at the collection centre during your next shopping trip to NTUC Fairprice! We were given ten of these hampers to load into the boot of the car and six delivery locations. Each person visited by the BB share-a-gift campaign receives two of these hampers. We are given an extra delivery location in case the people that we are visiting are not at home – it is not always possible to call the beneficiaries in advance as many of them do not own telephones. As I was travelling with J and Little E, we also took along with us two ‘Boys-In-Blue’ to help with all the heavy lifting (those red bags are HEAVY and it’s not possible for me to carry two of them!). It was a very good experience for us to see and meet the people who were receiving the hampers during the BB share-a-gift project. Most of the people whom we visited were elderly folk who were living alone in a neat little one-room flat but we also came across a few families that had many dependants. All of them were so pleased to see us and were very welcoming, especially towards J and Little E who cheerfully wished one a happy Christmas! Both J and Little E had many questions for me afterwards about poverty and how we can help people who live below the line. They were so happy that the families we visited would not be hungry during this festive season, and J expressed the hope that with the little money each family saved, they would be able to get something extra-special for themselves for the end of the year. Even the two Boys-in-Blue who rode with us seemed very thoughtful about the people that they had met who received the food hampers with such joy. So if you can spare a couple of hours this festive season, why not consider becoming a delivery service for the day and help someone in need? It’s such a simple way to give back to the community and you get the added benefit of seeing an immediate result! I promise you that it will be worth your while. Check out the Boys’ Brigade Share-a-gift website for more details.